The Powerblanket MD1010 Multi-Duty Concrete Blanket is a multi-purpose outdoor heat blanket used for curing concrete. This insulated concrete blanket provides even heating throughout the entire surface, and (depending on the environmental conditions) it is rated for 120 Volts, 1440 watts, and 12.00 Amps. The MD1020 has been obsoleted as of 12-31-18, so you must order the MD1010 or MD0520 heaters to help with your application. The Powerblanket EH0202 Extra-Hot Battery and Ground thawing Heater is a High-Heat Outdoor 120 Volt Electric Battery Blanket used for heating, thawing, melting, and protecting engines, batteries and the ground. The Powerblanket MD0320 Multi-Duty Concrete Blanket is a multi-purpose outdoor heat blanket used for curing concrete. This insulated concrete blanket provides even heating throughout the entire surface, and (depending on the environmental conditions) it is rated for 120 Volts, 960 watts, and 8 Amps. The Powerblanket EH0304 Extra Hot Ground Thawing Blanket is a multi-purpose outdoor heat blanket used for keeping the ground underneathe from freezing up. This insulated heated blanket provides even heating throughout the entire surface, and (depending on the environmental conditions). The Powerblanket MD0304 Multi-Duty Concrete Blanket is a multi-purpose outdoor heat blanket used for curing concrete. This insulated concrete blanket provides even heating throughout the entire surface, and (depending on the environmental conditions) it is rated for 120 Volts, 400 watts, and 2 Amps. The Powerblanket EH0310 Extra Hot Concrete Blanket is a multi-purpose outdoor heat blanket used for thawing frozen ground surfaces. This insulated blanket provides even heating throughout the entire surface, and (depending on the environmental conditions) it is rated for 120 Volts, 1100 watts, and 9.17 Amps. The Powerblanket MD0310 Multi-Duty Concrete Blanket is a multi-purpose outdoor heat blanket used for curing concrete. This insulated concrete blanket provides even heating throughout the entire surface, and (depending on the environmental conditions) it is rated for 120 Volts, 480 watts, and 4 Amps. The Powerblanket EH0325 Extra Hot Ground Thawing Blanket is a multi-purpose outdoor heat blanket used to keep the ground temperature underneathe above 32 deg F. This insulated heating blanket provides even heating throughout the entire surface, and (depending on the environmental conditions) it is rated for 120 Volts, 2750 watts, and 22.92 Amps. The Powerblanket MD0520 Multi-Duty Concrete Blanket is a multi-purpose outdoor heat blanket used for curing concrete. This insulated concrete blanket provides even heating throughout the entire surface, and (depending on the environmental conditions) it is rated for 120 Volts, 1440 watts, and 12 Amps. The Powerblanket EH0509 Extra Hot Ground Thawing Blanket is a multi-purpose outdoor heat blanket used for keeping the ground unfrozen. This insulated heating blanket provides even heating throughout the entire surface, and (depending on the environmental conditions) it is rated for 120 Volts, 1650 watts, and 13.75 Amps. The Powerblanket MD0510 Multi-Duty Concrete Blanket is a multi-purpose outdoor heat blanket used for curing concrete. This insulated concrete blanket provides even heating throughout the entire surface, and (depending on the environmental conditions) it is rated for 120 Volts, 720 watts, and 6.00 Amps. The Powerblanket Ght2002j Adjustable Thermostatic Controller. The Powerblanket BH05-RR (UPC 814491010925) Insulated 5 Gallon Bucket Heater is designed to achieve a maximum heater blanket temperature of 100°F. This 47" long heater has the Rapid Ramp technology, so bucket heating is accelerated during the start-up. The Powerblanket BH05-Pro (UPC 814491010932) Insulated 5 Gallon Bucket Heater comes with an Adjustable Digital Thermostat Controller for quick and easy temperature control up to 160°F. This 47" long heater utilizes standard 120 Volt power with 160 watts and 1.33 Amps to safely heat and insulate water, chemicals, oils and food products. 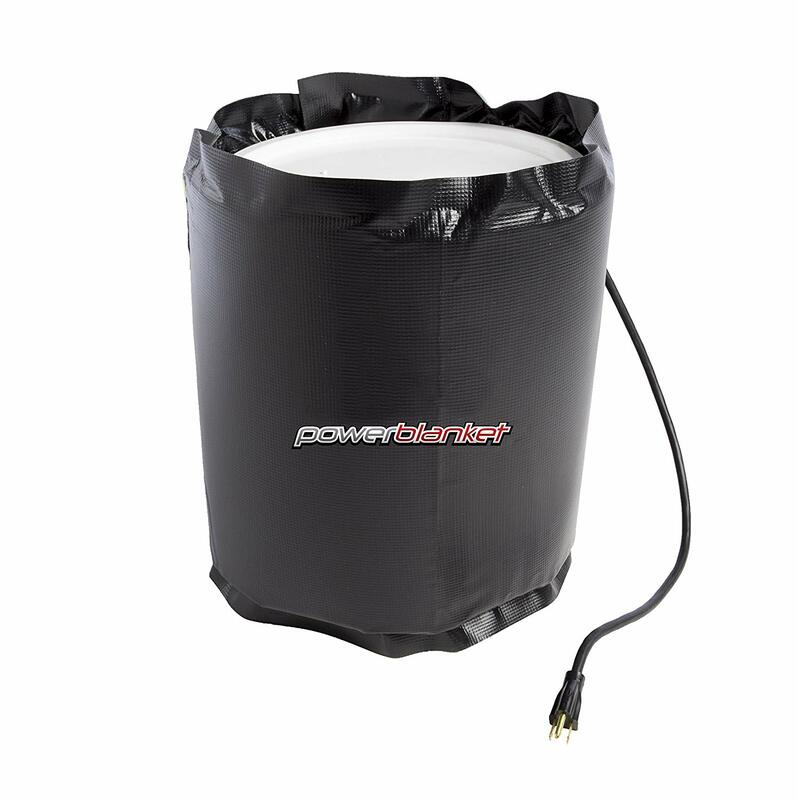 The Powerblanket tote heater TH275DG is an insulated electric 275 Gallon IBC tote heater. This heater blanket runs on 120 volt power with 1440 watts (12.0 Amp), and it is 174 inches in length. The tank warmer color is GRAY ALLOY, and the picture is for reference only.